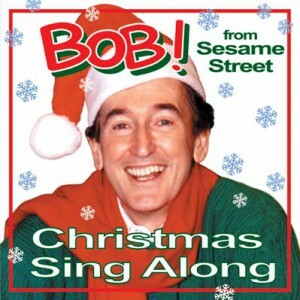 Christmas, music and memories with Bob McGrath (Bob from Sesame Street!) – Part 1 of a 2-part interview. [Editor’s note: This interview took place on Christmas Eve – 12/24/14]. Merry Christmas! Recently, Sesame Street celebrated their 45th anniversary and I had a chance to talk with Bob McGrath who plays “Bob” on the show! It was so special for me to talk with Bob, as he was a major part of my childhood, and has been a part of my daughter’s memories as we’ve watched current and classic Sesame Street videos together. Today’s post is Part 1 of a 2-part interview which focuses on Christmas. Bob discusses one his favorite episodes, “Christmas Eve on Sesame Street (episodes can also found on YouTube),” the making of his Christmas album, Bob’s Christmas Sing-Along, and how he celebrates this time of year with his Sesame Street family, as well as his own. No matter where you are, we wish you a Merry Christmas and hope that you can find some snuggle time by the fire as you delight in the gifts of tradition and family. Kids Can Groove: Merry Christmas! Thank you for taking the time to talk with me. We have been listening to your Christmas album and reminiscing about classic episodes on Sesame Street. After 45 years of being on Sesame Street, are there Christmas traditions that you all participate in together? 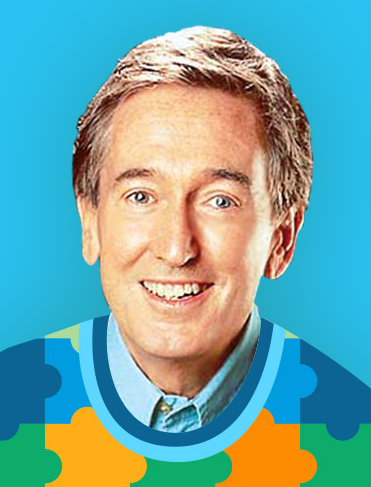 Bob McGrath: I feel very fortunate that I’ve been with an incredible show like Sesame Street for 45 years. The cast really is a very very close family. Loretta Long (“Susan”), Caroll Spinney and I are the three originals. In about the third or fourth year, Sonia Manzano (“Maria”) and Roscoe Orman (“Gordon”) and we just became a really really close family. In the past couple of weeks, some of us did a couple of hour long interviews for Sirius Radio, and a benefit for children at Mt. Sinai Hospital. The hospital had a nice little studio that someone donated with video equipment, and they video taped our performances. We did about a thirty-forty minute show with songs and stories, and because many of the kids are contagious the hospital had all the rooms wired with television sets so they all watched us in their rooms. [The kids] just get a tremendous kick out of seeing all of us talking to them and performing for them. We look forward to those kind of situations. Another wonderful event we had was in January 2013. Alan Muraoka (current owner of Mr. Hooper’s store), Alison O’Reilly (“Gina”), Pam Arciero (“Grundgetta,” Oscar the Grouch’s girlfriend), Leslie Carrara Rudolph (“Abby Cadabby”) and I did two events for the kids at Sandy Hook. One event was very large with dozens of folks from the Broadway theater, and a smaller one with a few muppets and cast. They were both very touching. After we entertained the kids, we received a letter from Mary Rose Kristopik, the Music Specialist, thanking us. KCG: What a wonderful gift for those children. Do you have a favorite episode on Sesame Street in relation to Christma? BM: My two most favorite specials were “Christmas Eve on Sesame Street” and “Goodbye Mr. Hooper.” Both were beautifully written and two of the best things we’ve done in 45 years. People have told me that they have watched “Christmas Eve on Sesame Street” every Christmas for 30 years. It really is beautifully written, and the scene I found very touching was between Will Lee, who played Mr. Hooper, and Bert and Ernie. It was like a “Gift of the Magi” moment where Bert and Ernie wanted to trade in their most favorite possessions, which was Ernie’s rubber ducky and Bert’s paper clip collection, so they could buy something wonderful for the other person. Bert and Ernie brought their favorite possessions in separately to Mr. Hooper’s store and he looked them over and very tenderly said, “Are you sure you want to give these up?” With almost a terror in his eye Bert said, “Yes,” and the same thing happened with Ernie and his rubber ducky. Later on in the episode, Mr. Hooper surprised them both with Christmas presents containing their very favorite thing in the whole world. He gave Ernie his rubber ducky back, and gave Bert his paper clip collection back. Will’s playing of that scene was just incredibly well done. He was a wonderful, long-tine professional actor in New York City. So that was a really wonderful special. In that same special I had an opportunity to sing a beautiful song, written by Sam Pottle and David Axlerod, called “Keep Christmas With You.” There is a really lovely surprise in the segment when I was singing and playing at the piano and Linda Bove (“Linda”) was in my studio with several children. As I stopped playing the piano, I turned around to hear the children singing “Keep Christmas With You,” and I realized Linda, who was deaf, had taught all the kids in the room the whole song in sign language. They were signing it as a Christmas present for me from Linda. It’s really beautiful, and I liked the song so much that it is the closing song on my Christmas sing-along, “Bob’s Christmas Sing-Along” CD, because the message is wonderful. That was one of my favorite moments. You know you can keep the spirit of Christmas all year long not just on Christmas Eve or Christmas Day. KCG: Is this a particularly special time of year for you? BM: Yes this time of the year has always been special, but seems to become even more so as the years go by, and the more grandchildren we are blessed to share this special day with. My wife Ann and I feel so grateful that we have been fortunate enough to grow older, be in good health, and see our children and our children’s children enjoy this holiday as we did years ago. Ann and I both came from a family of five, and have had the experience of a large family. KCG: Are there any special traditions you practice with your own family each year? BM: We celebrate Christmas on Christmas eve. I pick out a Christmas tree with my wife, and our grandchildren trim it on Christmas eve before dinner, which is fun to watch. Then, we have a big dinner early in the evening, and then the opening of presents. All afternoon and evening, we always have a fire going in the fireplace, and we come prepared with gifts for our Secret Santa. Our immediate family is now 17 so the presents pile up quite high under and around the tree. I sit on the hearth with my Santa hat on, and the three younger grandchildren are my elf helpers. They bring the presents to me to name and then they deliver them to the right person. They feel very grown up with this job! I get such joy out of watching the three youngest grandchildren, who are now 9 and 10 years old, growing up, but are still “believers.” I recently received a copy of the letters the three youngest wrote to Santa and they are priceless. KCG: How does music factor into your celebrations? Christmas music is always playing. We’ll often have recordings from my earlier work with Mitch Miller & the Sing Along Gang on Mitch MIller’s Christmas Sing Along, some of my other favorite artists, and of course my Christmas Sing Along CD as well. For many years my daughters, and the older granddaughters, have gotten together and sung Christmas carols and played guitar for us. Years ago, they used the song sheets that came with Mitch’s LP. My wife and I now get a kick out of watching them all pull out their iPhones or iPads and download all the lyrics! A new world! KCG: What are some of your favorite Christmas memories growing up? BM: Many of my favorite Christmas memories date back many years ago to a farm in Illinois where I grew up with my parents, two brothers and two sisters. Christmas was a very special event for our family – Mass on Christmas eve, or early Christmas morning, and then presents for all. We always left cookies out for Santa, which of course were all gone except for a few crumbs on the plate. One time my Dad pulled a great trick for us to see Christmas morning. We had a fence around the yard that was in need of repair, and so Dad went out after we were all in bed, and knocked a section down, and trampled the heavy snow where Santa landed. He was quite angry as he woke us up and told us that Santa and his reindeer wrecked his fence while landing the sleigh last night! I was the youngest of five, but that trick convinced my older siblings about Santa for many more years! KCG: Can you tell us more about your Christmas Album and why you were inspired to create one? BM: I had already recorded a CD for Babies, ”The Baby Record” with Katharine Smithrim which contains thirty-seven songs and activities for toddlers. I then created “Songs and Games For Toddlers,” (also with Katharine) which has about sixty classic songs on two CD’s for children, and “Sing Along With Bob (Vol I & Vol II).” Next, I created twelve of my favorite songs from Sesame Street, celebrating the first twenty-five years of Sesame Street, and honoring our two principal composers, Joe Raposo and Jeff Moss in “Bob’s Favorite Street Song” followed by “Sing Me A Story” (the first original set of songs). However, I had never done a Christmas recording. The structure of my “Christmas Sing Along” recording was greatly influenced by my former boss Mitch Miller, who is mostly responsible for much of my career. He kept his recordings simple so that everyone could sing along with the 25 guys in his gang. There were no fancy melodic or rhythmic tricks, just all in simple keys that would fit most voices and encourage everyone to sing along. I asked Mike Renzi, Sesame Street’s music director, arranger and fantastic pianist to help me produce “Christmas Sing Along.”Mike and I spent several weeks planning what the feel of each song should be. I thought it would be fun for kids to hear many different styles of music played by the incredible musicians we worked with: Country, Caribbean, Stride, Pop, R&B, and more. Mike chose the Sesame Street band who have been playing together since the show’s inception, and for just about every major artist in the country for many, many years. They are some of New York’s finest studio musicians: Mike Renzi, Sesame Street’s musical director, pianist, and arranger (Tony Bennett, Lena Horne, and Woody Allen); Lou Marini, saxophone and flute (Blues Brothers and Saturday Night Live); James Saporito, drummer and percussionist (NY Pops, Broadway music composer, Billy Joel, Tony Bennett, N.Y. Philharmonic, and Gladys Knight); Bobby Cranshaw, Jazz bassist (Ella Fitzgerald and Oscar Peterson); Jack Cavari, guitar (Alicia Keys, Frank Sinatra, and Aretha Franklin); and Buddy Williams, drums (Michael Jackson and Stevie Wonder). My good friend Francisco Nunez was also kind enough to bring a few singers from his very talented Young People’s Chorus of New York City to the session. It was nothing short of thrilling to have all these guys together playing their hearts out on this recording – sheer joy! Below you will find a YouTube playlist featuring 3 songs (“Feliz Navidad,” “Jingle Bells,” and “What A Great Christmas It Was”) from Bob’s “Christmas Sing Along.” Merry Christmas and Happy Holidays to everyone! When I first saw the above comic, I was instantly struck by the profundity of its meaning. Amidst all of the holiday hubbub, I tend to overlook the true end result as I focus on finding just the right gifts, braving the lines at the post office, and getting ready for travel. 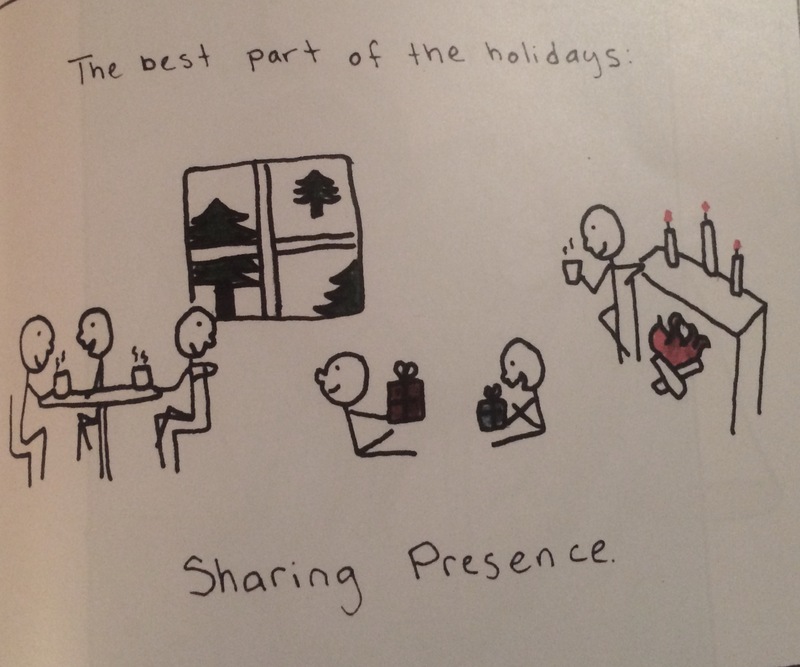 Whether it’s being with family, pets, friends, or a larger community, being in the presence of people/loved ones really brings the best kind of presents. Music is another source of joy, especially during the holidays. We’ve been listening to classics from previous playlists, as well as a few new items mentioned below that have definitely added to the sentiment of presence. Below you will find a nice mix of Chanukah and Christmas music. Enjoy! Sometimes it’s hard for me to come up with just the right words to describe a song. Sometimes, a song’s composition is so striking that I can’t help but first “feel” the song. I hear it, yet the music is so rich, so deep that the sounds take me away. Lisa Loeb’s new Chanukah single, “Light,” does exactly that. It’s a gorgeous song that radiates like the warm glow of freshly lit candles. Renee Stahl, singer-songwriter and one half of the kindie group Renee & Jeremy, harmoniously echoes Loeb with a quiet intensity, filling the air with a special sense of hope. Loeb wrote the song in honor of Chanukah, and to remind us that we can all continue to shine brightly and steadily, with or without the flame. What can happen in a matter of two weeks? One of the Bay Area’s finest musicians, Alison Faith Levy, expertly answers that question with grace and ease. Inspired by the ukulele tutorials we have been doing over at Moms Making Music, Levy went out and bought herself a uke, learned how to play it AND wrote and produced an original Chanukulele (Chanukah + Ukulele) song and video! In just 2 weeks! And it’s a great song! If you don’t own a uke yet, you might just be inspired to pick one up after watching this video. You can sing along with Alison by reading the lyrics she posted on her official site. Interested in learning how to play the ukulele? Learn along with us through our tutorials at the Moms Making Music Facebook page after you enjoy Alison’s performance in the video below. Back with another holiday jingle, MCJ and the Chocolate Chips come together to spread love, warmth and spirit with a soul-filled throwback to the classic sounds of the 50s. “Got the Spirit” captures the essence of being present during the holiday season by encouraging us to slow down, take a breath, and rock on with our Superbad selves as we soak up the good vibrations of those around us. Slow it down…take a breath. That make you feel so blessed. Michael Rachap, creator of Readeez, produces original songs and pairs them with animated, lyric videos in an effort to promote a better understanding of the quirky “rules” of the English language, i.e. knowing how letter sounds change when they are next to a vowel. By pairing music with lyrics and illustrations learning is reinforced through visual prompts that aid in pronunciation and foster a deeper understanding of basic concepts. We love watching Readeez videos and with each one, I can point out and talk with my daughter about the differences between what we see, hear and speak. Readeez’s latest video is an original Chanukah (or Hanukkah depending on your spelling preference) song called “One Blue Candle,” which is in honor of the one blue candle that diligently lights each candle on the menorah every night of Chanukah. It’s part counting song, part holiday song. Simple, but like any Readeez video, colorful, informative and meaningful. The Pop Ups bring a “family jam” to the fold with “Favorite Cousin” which, as the name indicates, is about celebrating with your favorite extended family member(s). If this song happened to show up at a holiday party and pour itself a cup of egg nog, it would not be weird at all. “I Walk So Slow Under the Mistletoe,” is a whimsical little song that captures the spirit of tradition sprinkled with just the right amount of kitsch. Martin pairs up with singer-songwriter Kat Edmonson whose unique voice blends in a nice dose of retro sweetness. Edmonson also appears on Martin’s debut children’s album, We’re All Young Together, in “Hey Sister.” I really love the pairing of these two timeless-sounding voices. I love holiday music that doesn’t try too hard to be holiday music. Sure, most holiday music is covers of covers and renditions of originals but some carry a particularly nostalgic sound that captures the joy of the season in a way that feels authentic and is wonderful to hear on repeat. 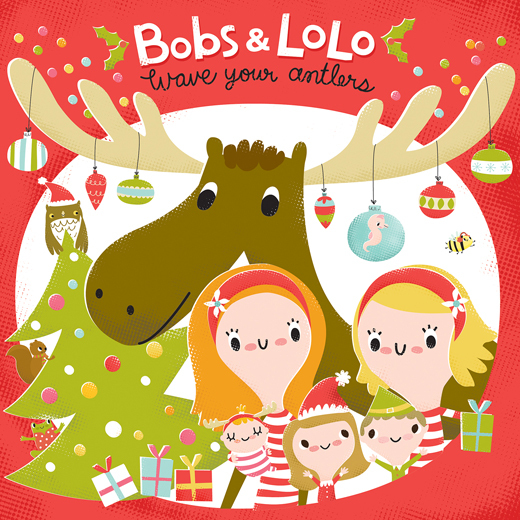 British Columbia duo, Bobs and Lolo, created a holiday album called Wave Your Antlers with 15 songs that make things warm and cozy with both originals and classics (“Frosty the Snowman,” “Rudolph the Red-Nosed Reindeer,” for example). There is a lot of fun packed into these songs which includes the introduction to a Christmas moose, named “Chris Moose,” naturally (see video below). “Go Freeze” offers the opportunity for a family game of freeze dance, while the unexpected rendition of “Dona Nobis Pacem,” which is latin for “Grant us peace,” gives you some downtime and pairs beautifully with candlelight. Robyn Hardy (Bobs) and Lorraine Pond (Lolo) harmonize in a way that is reminiscent of the Dixie Chicks which is most notably heard on “Old Toy Trains,” a sweet song which is a slight lullaby or soft nudge encouraging little ones to get some sleep in preparation for the arrival of the man in red. Their joy is infectious which is another part of what makes this album so lovely. You can’t help but get happy as you sing right along with them. This album has become a family favorite which I envision being a part of our collection for years to come. Enjoy the below video playlist which features a selection from Wave Your Antlers, including: “Chris Moose” (official), “Frosty the Snowman” (lyric), “Old Toy Trains” (lyric), “Up Up Up” (official), and “Go Freeze” (official). The practice of being mindful is often associated with being still, so as to be fully in the moment. It’s not thinking about the past or future, but a distinguishable present. The idea of purposefully being in the moment, and not thinking about the flurry of things waiting to be checked off throughout the day, or the things I didn’t get to yesterday, seems like an impossible feat on most days. The times I feel most in the moment are when I’m listening to my favorite song, or when I’m dancing. Yoga is also a reliable resource that helps me find a way to just be. My daughter is very active and though I have tried to connect with her through yoga, encouraging her to try out various poses, she regularly finds a way to augment our practice by challenging me to try an even harder Twister-like pose or some sort of gymnastic move like flipping over the arm of our couch and then flying down to the floor. Though our zen moments tend to be more active than still, I appreciate that we can both just “be” together, in the moment, mindfully trying things out. Kira Willey, a popular kindie artist and musical yogini, recently released her third album, How to be a Cloud; Yoga Songs for Kids Vol. 3. Similar to her previous albums, this one includes a full-length “side” of 13 songs followed by 9 bonus tracks featuring yoga instruction. So depending on how you’re feeling, you can choose to sing, dance or get your yoga on, all of which are viable vehicles for cultivating mindfulness, and can be done at the same time. It also helps that the album includes a booklet illustrating yoga poses which removes any awkwardness that comes with trying to figure out how you should position your body. What struck me most about this album is the clever way the songs are arranged. While most albums usually build to a peak and then wind down, ending with a soft song or lullaby, How to be a Cloud was organized such that the slow songs are interspersed throughout the album. The changing from upbeat boogie tunes to soft, restful songs is similar to the way a yoga class might run where there is guided movement and then there are holding poses. By giving kids the opportunity to be active for a few songs, they are more likely to engage with the slower songs that pique their imagination. “Kids need to move their bodies, it’s how they learn best,” notes Willey. I noticed this with my daughter whose method of cultivating mindfulness is through action, as mentioned above. Feeling her feet hit the ground and then push upward again provides her brain with enough feedback so that she is able to focus and reap the restorative benefits of songs like the title track (“How to be a Cloud”), which encourages sitting and imagining what it feels like to be a cloud, feeling the weightless floating. The restful lullaby, “When You Sleep,” also offers the opportunity for a reflective pause as Willey’s peaceful wishes gracefully glide like dandelion seeds through the air. “Colors – 2014,” a remix of the original song that appeared on Willey’s first album, Dance for the Sun, and was later featured in a Dell commercial, features a choir of 75 Kindergartners who bring a powerful element as they sing “I am a rainbow today/ all the colors of the world are in me.” Many listeners will relate to “Dancing with My Daddy,” which is basically a literal translation of the utter joy and magic that happens when Daddy comes home, while “Jazzy” and “Cookie Jar” nab you with some catchy lyrics and hip shaking rhythm. Just try and get those two out of your head! Willey’s approach to songwriting and passion to encourage kids (and grown-ups) to find beauty in themselves is ever-present throughout this album. Each song, whether upbeat or slow provides a meaningful message that delivers a sense of calm and comfort. Delivered through beautiful melodies, How to be a Cloud offers the comfort of a hug, the warmth of a cup of hot cocoa on a cold day, and a heart full of gratitude. Families will enjoy spending time with this album in a variety of ways, which is especially nice on wintry days when Jack Frost is nipping at our noses. Definitely recommended. – SiriusXM Satellite Radio’s Kids Place Live (Channel 78) airs Willey’s “Backseat Yoga Breaks” in the morning on the Absolutely Mindy show. The “Backseat Yoga Breaks” guide children in breathing exercises, mini stretches and guided imagery that can be done in the car. – Willey has a musical yoga-for-kids interstitial series that airs on selected PBS TV affiliates! Connect with Willey via Facebook, Twitter and her official site where you can purchase How to be a Cloud, as well as merchandise (including a ribbon ring to use while you dance to “Colors” as shown in the video below). It’s been raining here in the Bay Area for a few days and although we desperately need to quench the thirst of our dehydrated soil, I can’t help but miss the sun. So, the impetus for today’s post is to offer some sunshine and a little entertainment should you also find yourself spending some time indoors. There are also a couple of videos for those who want to soak up some of mother nature’s offerings and find adventure in the elements. “Pretty Crabby” by Caspar Babypants from Rise and Shine! Also worth checking out is “Bird in an Airplane Suite” (embedding not enabled). “My Home” by Brady Rymer and the Little Band That Could from Just Say Hi! Tunes for Tots: give the gift of music! Recently, Steve Denyes – of the band Hullabaloo – posted that for the months of November and December they will be donating one CD to Toys for Tots for every one that is sold. So far it has been a success with 327 CDs sold (as of 12/2/2014)! Amazing! This act of giving has inspired me to think more about how I can help bring joy to children and families in the same way while also supporting independent artists. Music is such a valuable resource, capable of providing hope, support, relief, restoration, healing and love (the list could really go on!). Why not spread some of it around? You can check out Hullabaloo’s FB page for updates as well as some of the other artists who have expressed interest such as Karen Rives Kalafatas of Karen K and the Jitterbugs, Jason Didner of Jason Didner and the Jungle Gym Jam, Trevor of The Zing Zangs and GooberKids Radio, Peter Alsop and Sarah Gardner. If you’d also like to make a musical donation, check out the Toys for Tots drop-off directory to find a local location. Consider including music from your favorite artist(s) in your donation(s) or you can purchase a CD from one of the aforementioned artists who will ship one on your behalf. I will be posting a list of my 2014 music picks shortly which I hope will offer you even more ideas for holiday gift giving.